Asteroid 39 Laetitia will be well placed for observation, lying in the constellation Capricornus, well above the horizon for much of the night. Regardless of your location on the Earth, 39 Laetitia will reach its highest point in the sky at around midnight local time. From Ashburn, it will be visible between 21:39 and 04:30. It will become accessible at around 21:39, when it rises 21° above your south-eastern horizon, and then reach its highest point in the sky at 01:06, 41° above your southern horizon. It will become inaccessible at around 04:30 when it sinks to 22° above your south-western horizon. At around the same time that 39 Laetitia passes opposition, it also makes its closest approach to the Earth – termed its perigee – making it appear at its brightest in the night sky. This happens because when 39 Laetitia lies opposite to the Sun in the night sky, the solar system is lined up so that 39 Laetitia, the Earth and the Sun lie in a straight line with the Earth in the middle, on the same side of the Sun as 39 Laetitia. 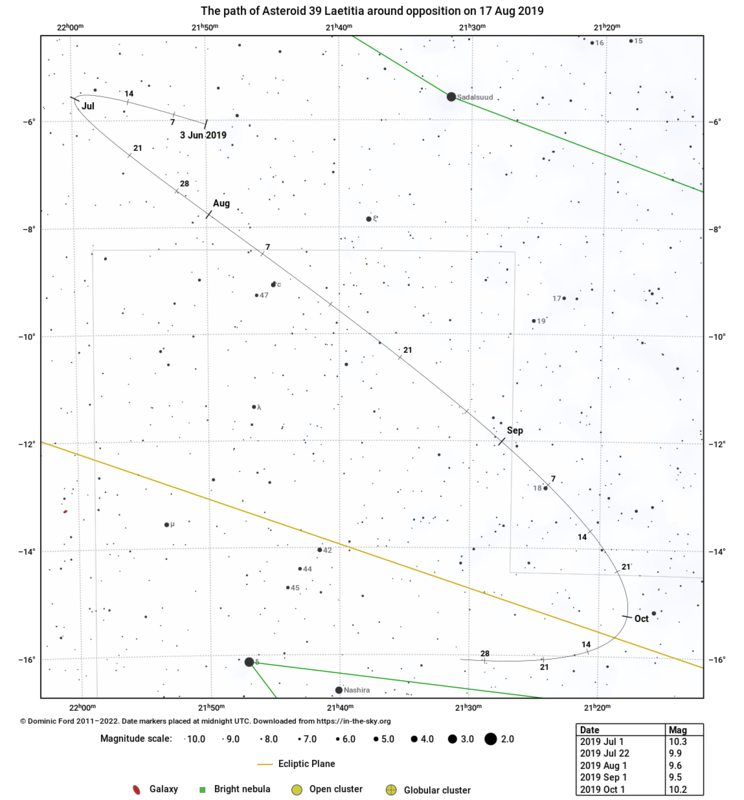 On this occasion, 39 Laetitia will pass within 1.523 AU of us, reaching a peak brightness of magnitude 9.1. Nonetheless, even at its brightest, 39 Laetitia is a faint object beyond the reach of the naked eye or binoculars; a telescope of moderate aperture and a good star chart are needed. 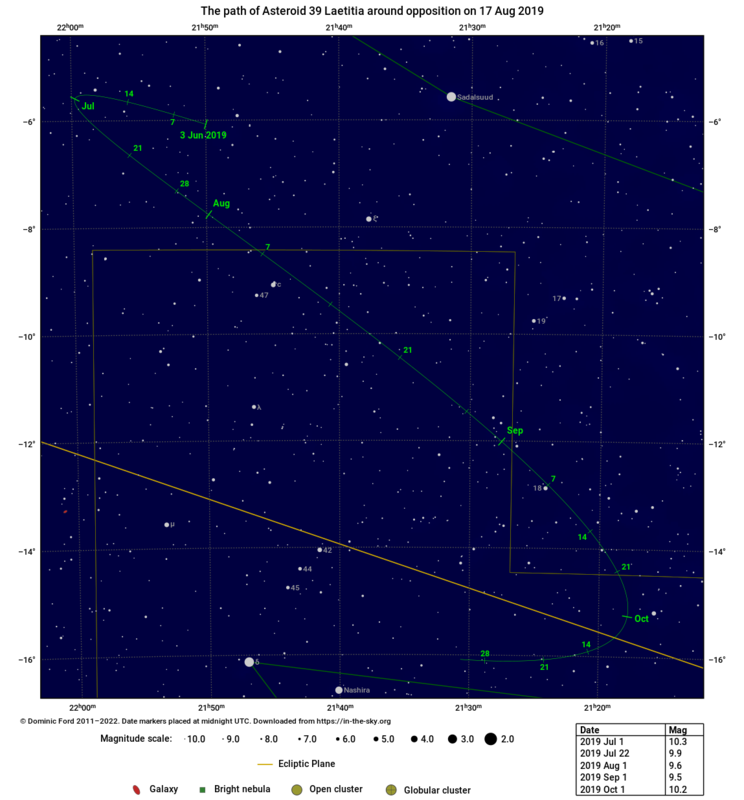 The star charts below mark the path of 39 Laetitia across the sky around the time of its opposition.